Versatility like no other! TANA professional waste shredders are capable of shredding difficult materials such as mattresses, tyres, cables, ragger wire, municipal solid waste (MSW), or construction and demolition waste. Thus you will be able to both recover valuable materials and reduce the waste volume. TANA Shark waste shredders are designed for shredding the widest range of materials. Shredder enables full control over the particle size from 50 to 500 mm (2” to 20”) with lowest operating costs. This enables time and cost savings as it is possible to perform shredding in just one pass. The high level of customization possibilities over the size and homogeneity of the end product saves our customers both time and money: TANA Shark can replace two shredders and a screen by producing the wanted particle size in one pass. With other solutions on the market, this might require up to two shredders and a screen when a small particle size is required. This is the key factor for lowering both fuel and labor costs, which turns every shredding process into a more profitable one. Instead of purchasing a machine for a certain waste type or end product size and being limited to that, TANA Shark leaves the door open for additional business possibilities. Renowned for designing long-lasting, robust machines, Tana engineering aims at the best customer experience through durability and high uptime. 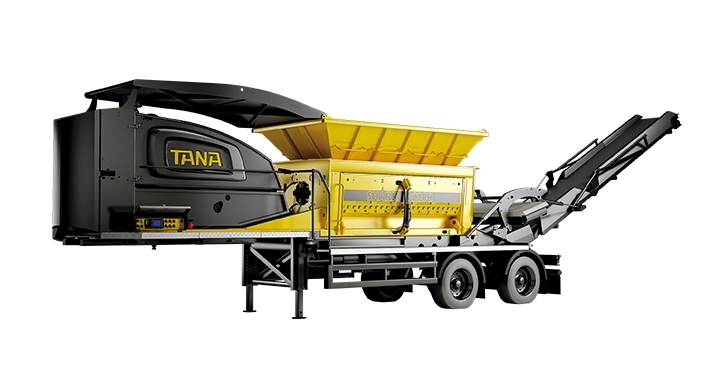 TANA Shark has a hydrostatic power transmission, identical to the one used in TANA landfill compactors. It introduces a patented *swing frame construction. The robustness of the Shark is shown in its weight. The material of the wearing parts, such as the rotor knives, is an alloy developed specifically for the TANA Shark. Detailed reports and real-time information on the processes efficiency enable better control on increasing the profitability.